18 years ago, Final Fantasy VII took the world by storm. Now in 2015, return to this classic title on your PS4 in a not-so-new way. Last year it was announced that Final Fantasy VII would be making it’s way onto the PlayStation 4. At PlayStation Experience 2015, Square Enix suddenly announced that players would be able to play the game that day. I decided I would make the dive into the game once more. In comparison to the PC version, the game remains largely the same on the PlayStation 4. It’s still the same story, and features the updated translation from the PC version. One notable improvement from the PC version is that the character models no longer have their O mouths. 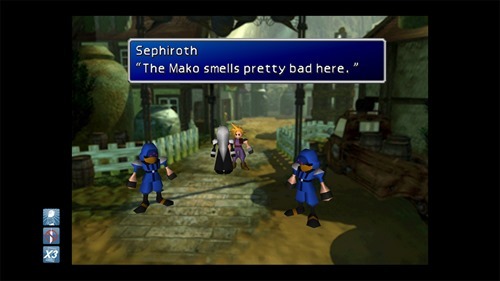 This means that you can actually take Sephiroth a lot more seriously, without being distracted by his mouth. Other than the removal of the O mouths, the graphics remain as they were on PC. The music is not the midi version, and is the original soundtrack that was featured on the PlayStation version. Speaking of the graphics, it is a bit disappointing that they didn’t do something with the gigantic black border. It is nice that they maintained the original 4:3 ratio, but something should have been done with that black border. Many other older titles that received a release onto newer PlayStation consoles received some sort of background image so that there wasn’t just a bunch of black. 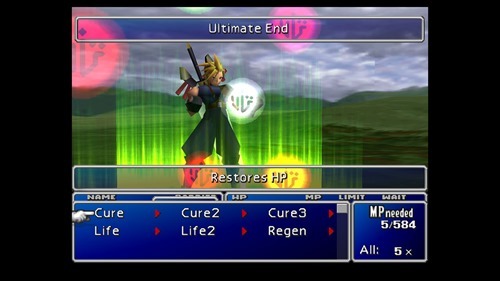 Prior to the release of the PS4 version, Final Fantasy VII saw a release onto iOS devices. This release featured the addition of cheat buttons. These were also brought onto the PS4 release – no encounters, 3x speed up, and “god mode”. These do about what you would expect them to do. No encounters disables all random encounters. 3x speed speeds up almost the entire game – it doesn’t speed up certain screens and no FMVs are sped up. God mode completely refills your HP with every turn you get, along with giving you a full limit break gauge every turn. This mode won’t revive dead characters though, so if you chose to use this, you would still have to manually revive people. I did notice a few odd graphical glitches, though I’m not quite sure if they were present in the PC version. Occasionally, Cait Sith’s character model would freak out some, becoming deformed for a few moments. I only noticed it with his model though, but he definitely got a bit weird at times. 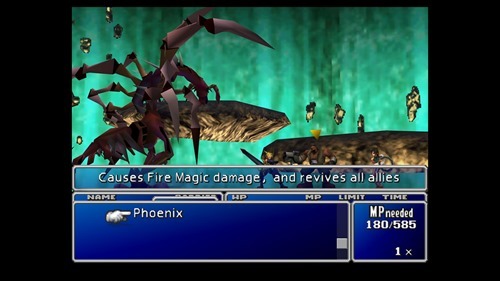 In general, Final Fantasy VII is a fine port to PS4. For those of us who have played it many times before, the 3x speed is a nice addition to get through all those pesky, massive, cutscenes. The broadcasting blocking is fairly minimal, though it does block a certain scene at the end of Disc/Part 1, and then fails to block it in flashbacks later in the game. While I generally don’t mind Midi music, it is nice to hear the regular soundtrack with the game. If you really want to get through it a lot easier – though the game is already easy enough as is – you have the ability to do so if you wish. If you’re already a fan of the game and have been itching to play it then the game is a great buy. If you haven’t played it before, the game hasn’t really aged too well in quite a few places, and you might just be better off waiting for the Remake. Oh yeah, and one of the trophies if called Best Bromance. Who can really pass that up?